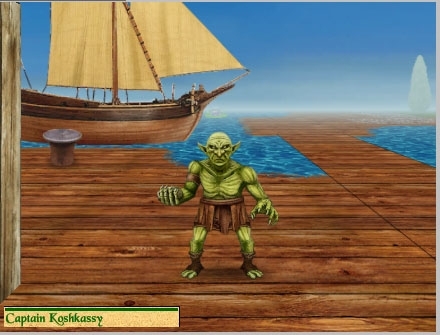 How do you get past the goblin on the bridge to good luck island? He has nothing to do with getting to Good Luck Island. You have to get further in the game. When you do, a bridge will appear. You have to do all of Mr. Tainnik's quests and then he'll make the bridge appear to Good Luck Island appear. I did all the quests and a bridge did in fact appear problem is the goblin guy is standing in the middle of it so I can't get through. I just tested this and he doesn't block your path if you step to the right around him. He doesn't move from his position. Did Mr. Tainnik give you the Governor's Crown? When he does that, he sets the bridges visible but the goblin doesn't block it. I have the crown of cologreve, and I tried talking to Mr. Tannik again he just says something about killing kozney another day. I cannot in any way get around the goblin. Do you have an earlier save file? Can you put up a pic? The goblin just stands in his spot but if you have got the bridge visible--you can cross it. I just tested it. Are we talking about the same spot I wonder? I don't have an earlier save, and I'm not sure how to take a screenshot. I am playing on an android phone. I am almost 100% certain it's the same spot. On Android phone to take a screenshot, press power button together with volume up (or maybe down) button. It will make screenshot and you can then post it. What type of graphics file is it? I'll post a screenshot of where I am when I can cross the bridge. Then maybe tell me if that's where you are. I don't want to move the goblin as that might cause problems for other players. Here is where I face the goblin with the bridge visible--I can move to the right and walk across or I can go around to the left and go a pace or two forward and then left and cross. No one else as far as I know has reported this problem. I don't know what type of file it is, i just know it refuses to let me upload the screenshot. Also in my game he is standing in the center of the bridge and impossible to get around. I assumed it was because i needed to talk to someone, but i have no idea who that would be. I don't think it has anything to do with talking to anyone. You could try sleeping in an inn for 21 sleeps and see if he's still in the same spot. But he shouldn't be. Okay, that worked he is no longer in the way. Thank you, I never would have figured that out on my own. Sleeping 21 sleeps resets the game and often cures mobile glitches. Of course, it revives a lot of monsters you killed, but you'll get more xp killing them again. I'm glad it worked for you.